Sebbie & Pilgrim Eggs – Hatched. geese, hatchaholic, incubating eggs, incubating goose eggs, incubating peafowl eggs, Pilgrim, Sebastopols. I’ve been meaning to post about them, but I’ve been sidetracked by something else the last two days. On Monday (day 29), all three Pilgrim eggs and one Sebastopol hatched out. It was a close race between Sebastopol Egg D and Pilgrim Egg D which one would hatch first, but in the end the Sebbie earned that distinction. Within less than four hours the Pilgrims had all hatched out, too – it was a very fast hatch compared to most waterfowl I’ve done (they must have been in a hurry to get out). After the last Pilgrim gosling had hatched, I candled the remaining Sebastopol egg (which was Egg C) and noticed that there not only wasn’t any sign of internal pipping, but there also wasn’t any indication that it was even alive anymore. So, I very carefully performed an eggtopsy (opening the egg on the large end where the air sac is located just in case I was wrong) to find that the gosling had died most likely a few days before. It’s always disturbing to open unhatched eggs and find perfectly formed babies – it makes me that much prouder of the one Sebbie that did hatch. By the way, my mother is in love with the Sebastopol, and has named her Blueberry. The goslings in the Brinsea waiting to be moved to their brooder. The Pilgrims are grouped together on the left and the Sebbie is on the right. Now, for a little about the Pilgrims. They’re an autosexing breed, which means they can be sexed by their appearance even as day olds. 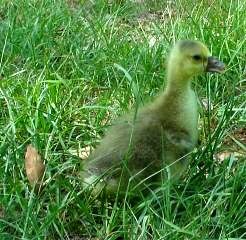 Male goslings are yellow or silverish with light bills and feet, while females are a green-gray with darker bills and feet. When I first saw the Pilgrim goslings (they had just hatched and were still wet), I thought, “Oh no, three girls.” Now, they’re dry and fluffed out, and I think we can safely say they’re all boys. So, Aubrieanne will have her choice of mates next year – good thing since she is a very picky girl. By the way, for comparison, below is a picture of Aubrieanne taken last year when she was just a few days old. We haven’t decided on any names for the boys, yet, but I’m sure they’ll have fitting monikers before long. The pea eggs have a little less than two weeks left in their development. I think all seven eggs look like they’re doing fine, but at this stage in development they’re much, much harder to candle. Next post: Another Road Trip to Paxton, FL? Wooohooo! Delighted that all four are safe and well, but especially glad that a Sebbie made it through. Sad about the one that died in its shell though. Thankyou for the update – I was waiting with bated breath.